The unusual American Snout, well-known to observers further south, is still quite an uncommon visitor to Massachusetts. Snouts are an ancient sub-family of butterflies, as their prehistoric look suggests: Libytheinae can be traced back some 35 million years in the Colorado fossil record, along with the hackberry trees with which they were most likely associated (Emmel et al. 1992: 6-7). Scudder describes the Snout’s status in New England in the nineteenth century as exceedingly rare. The only specimen known from Massachusetts at this time was said to have been taken by Thaddeus W. Harris in his garden in Cambridge on June 24, 1849 (Scudder 1889: 764; 1862). American Snout had also been found once at New Haven, Connecticut in the 1800’s. Still more extraordinary to Scudder were two specimens in the collection of a Dr. F. F. Hodgman of Littleton, New Hampshire, north of the White Mountains, which were said to have been captured in that vicinity in roads through the woods. There are no Massachusetts specimens of American Snout in the Museum of Comparative Zoology today, in the Yale Peabody Museum, or in the Boston University collection. But two additional nineteenth century specimens from Milton are reported in the literature: July 17, 1896 and August 9, 1896, both collected by C. O. Zerrahn, and Sprague is said to have collected it at Wollaston in the 19th century (Farquhar 1934). After these nineteenth century reports, there appear to be no other records of American Snout in Massachusetts until 1972, when Wayne Peterson found one at Chatham (Barnstable Co.) on October 14, 1972 (MAS Atlas records, specimen). A decade later, during the actual five-year Atlas period 1986-90, there are five sight records: Salem 9/1/1986, C. Arbogast; Natick 6/28/1987, M. Kasprzyk; Sudbury 7/22/1987, R. Walton; Milton 7/6/1988, R. Abrams, and Sheffield 9/10/1990, G. Hess. American Snout is a permanent resident across the southern states and into Mexico, with periodic irruptions into more northerly climes. It is not known to survive New England winters, but may overwinter as far north as New York city (Cech 2005). All North American snouts are now considered to be a single species, but our eastern race is known as Libytheana carinenta bachmanii (Pelham 2008). American Snout is a hackberry tree specialist. Its main host in Massachusetts would be northern hackberry, Celtis occidentalis, a tree native to every county except Barnstable (Cape Cod), Dukes (Martha’s Vineyard) and Nantucket (Sorrie and Somers 1999; Magee and Ahles 1999). Both this hackberry and others, e.g. C. laevigata or sugarberry, are often planted in parks and along urban streets, and so hackberry trees can probably be found in almost every county or town in the state. They are more widespread than the butterflies associated with them. Other hackberry tree specialists in Massachusetts are the Tawny Emperor and the Hackberry Emperor, both currently found only in the lower Connecticut River valley. The emperors are almost always found in close association with hackberry trees, and do not wander far from them. The Snout, on the other hand, being an irruptive species, may often be found as a vagrant in areas with no hackberry trees nearby. American Snout takes nectar from a wide variety of flowers, including dogbane, goldenrod, asters, and milkweeds. 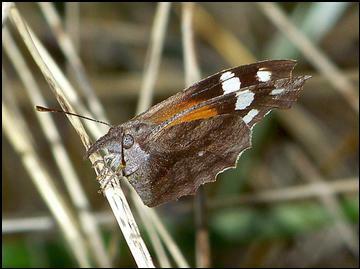 It is thought that the characteristic huge palps of the Snout butterfly function to provide camouflage. When the butterfly is at rest with wings closed, the palps resemble a leaf petiole and the closed wings resemble a leaf (Scott 1986: 344). American Snout is not as rare in Massachusetts today as it seemed a century ago. During the 1986-90 MAS Atlas period it was still termed a "rare vagrant," but its appearance has been getting more predictable since then, and it could be now termed a "regular visitor." American Snout was seen in 14, or half, of the 28 years 1986-2013, as shown in Table 38, which includes all Atlas and MBC data. There is no year which would qualify as an “invasion;” there are usually only one or two reported per year. Between 2007 and 2012 there was at least one sighting every year, but in 2013 none were reported. 7/21/2012 1 PITTSFIELD CANOE MEADOWS WS T. Tyning et al. Also in 2010, American Snout made it to Martha’s Vineyard, in a first for that island (9/6/2010, M. Pelikan). There are no historical or other recent reports of Snout from either Martha’s Vineyard or Nantucket (Jones and Kimball 1942). While American Snouts are most frequently reported from coastal locations in eastern Massachusetts (Salem, Westport, Falmouth, Chatham, Aquinnah, Truro, Wellfleet, Ipswich), there are also scattered reports from inland locations throughout the state, including eastern Massachusetts (Natick, Sudbury, Milton, Rehoboth), the Connecticut River valley (Hadley, Northampton), and the Berkshires (Pittsfield, Sheffield, Windsor). See Table 38. Since 1970, American Snout has been found in Massachusetts anytime from late May through October. The MBC flight chart at http://www.naba.org/chapters/nabambc/flight-dates-chart.asp reflects only sightings through 2008; for the full sightings list see Table 38. Earliest sightings: The earliest report is 5/20/ 2010, Windsor. The next earliest is 6/2/2011, Wellfleet, and the next in recent years is 6/28/1987 in Natick. Latest sightings: W. Peterson’s 10/14/1972 report from Chatham remains the latest known date; the next latest date is 10/12/2008, F. Model Northampton community gardens. The majority of reports in Table 38 are in September, the month when this species is most likely to be found in Massachusetts. If American Snouts arrive in June or July, they could easily breed and produce a second generation in Massachusetts, but this has not yet been definitely demonstrated. The butterfly has two broods south of New York. American Snout is not believed to survive Massachusetts winters. In its periodic flights out of the southern and southwestern states, American Snout has made it as far north as Vermont (first state record 2002), Maine (a few reports), and Ontario (many records, Layberry 1998). American Snout should continue to be found in Massachusetts, and sightings may well increase. Data are too sparse to demonstrate any increase over the last 25 years, but future increase in sightings seems likely, given climate warming (Table 6). Butterflies which may be affected by climate warming are shown in Table 6.